Fostering Media Connections is a non-profit news organization that uses a mix of investigative, accountability and solution-oriented journalism to drive reform within the systems that serve vulnerable children, youth and their families. Beyond producing stories, FMC employs an aggressive dissemination strategy to see its stories re-published in other media outlets. Last fiscal year, FMC-produced stories were picked up 753 times, a 50.2 percent increase from the previous year. Pickup from other outlets expands the impact these stories can have to generate public and political will for reforms benefitting vulnerable children, youth and families. 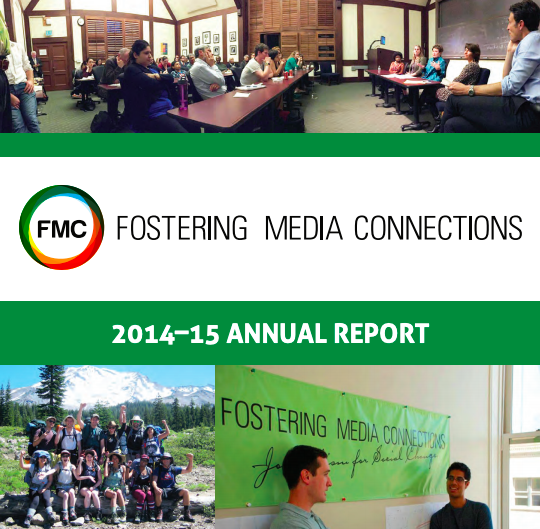 FMC has grown by leaps and bounds each year, often climbing both figurative and literal mountains, as evidenced by the cover of our 2017-18 annual report featuring our Questival team. We are proud of our work, the people who make it possible, and the people who inspire us to keep going when the climbing gets tough. We hope you enjoy reading about our achievements. We subscribe to standards of editorial independence adopted by the Institute for Nonprofit News (INN). Fostering Media Connections retains full authority over editorial content to protect the best journalistic and business interests of our organization. We maintain a firewall between news coverage decisions and sources of all revenue. Acceptance of financial support does not constitute implied or actual endorsement of donors or their products, services or opinions. Fostering Media Connections may consider donations to support the coverage of particular topics, but our organization maintains editorial control of the coverage. We will cede no right of review or influence of editorial content, nor of unauthorized distribution of editorial content. Fostering Media Connections will make public all donors who give a total of $1,000 or more per year. We will accept anonymous donations for general support only if it is clear that sufficient safeguards have been put into place that the expenditure of that donation is made independently by our organization and in compliance with INN’s Membership Standards. We will make public all donors who give $1,000 or more per year. As a nonprofit, we will not accept donations from government entities, political parties, elected officials or candidates actively seeking public office. We will not accept donations from sources who, deemed by our board of directors, present a conflict of interest with our work or compromise our independence. FMC has staff and Youth Voice writers across the country. And, we are hiring for two new positions. Daniel Heimpel is the president founder of Fostering Media Connections, a national non-profit news organization dedicated to issues facing vulnerable children youth and their families, an educator and an award winning journalist. He has taught graduate students on the intersection of journalism and child policy at USC’s Sol Price School of Public Policy, U.C. Berkeley’s Goldman School of Public Policy and the University of Pennsylvania’s School of Social Policy and Practice. In addition, through the Journalism for Social Change Massive Open Online Course, offered on the edX learning platform, Heimpel has trained thousands of students globally. Heimpel has written and produced stories about vulnerable children for Newsweek, The Los Angeles Daily News, LA Weekly, The Seattle Times, The Oprah Winfrey Network, KPCC and KCRW among many others. This coverage has garnered him journalism awards from the Children’s Advocacy Institute, The Los Angeles Press Club, The North American Resource Center for Child Welfare, The National Association of Social Workers, The Child Welfare League of America and California Mental Health Advocates for Children and Youth, and The California Social Work Archives among others. Christie Renick (she/her/hers) is a writer with a background in marketing, communications and graphic design. She holds an MPA from the University of Southern California and an MFA in Creative Nonfiction from the University of Idaho. She completed her undergraduate studies in sociology and writing at Northland College, an environmental liberal arts college located on the shores of Lake Superior. Christie became interested in child welfare, and particularly in the experiences of transition-age youth in foster care, because of her mother’s experience as a foster youth aging out of the system in the 1970s. One of her objectives is to tell the stories of foster care in a way that inspires action in people of all backgrounds. She joined the FMC team in 2013, originally reporting on child welfare in Los Angeles and assisting with fundraising and development. She became managing editor in 2015. Today Christie is FMC’s vice president, based in Tucson, Arizona, where she reports on policy and practice primarily in Utah, New Mexico, Texas and Arizona. She’s particularly interested in child marriage laws as well as the intersection of child welfare and LGBTQ rights, immigration and American Indian communities. John Kelly is the editor-in-chief of The Chronicle of Social Change, FMC’s daily news website covering the fields of child welfare, juvenile justice and other youth-related services. He has been reporting and editing coverage of youth services since 2001, and is passionate about connecting these fields to quality, independent journalism. Kelly began his journalism career at Youth Today, where he began as an intern and over the course of ten years became managing editor. He helped launch The Chronicle in 2013, and oversees development and planning of the website’s coverage. He also writes Youth Services Insider, a regular column that focuses on national issues and federal policy. Kelly lives in Detroit with his wife Sarah, with whom he also runs a small trivia-writing business. He enjoys crosswords, live music and bicycling. Kim Phagan-Hansel is the managing editor of The Chronicle of Social Change and editor of Fostering Families Today (FFT). She has served as the editor of FFT since 2001 and transitioned to the FMC team with the acquisition of the publication in 2017. In 2014 she was honored with an Angels in Adoption award from the Congressional Coalition on Adoption Institute. The same year, FFT received an Adoption Excellence Award from the U.S. Department of Health and Human Services. Kim has a bachelor’s degree in English/Journalism from Chadron State College in Chadron, Nebraska. Prior to her work covering child welfare issues, she worked for the Longmont Daily Times-Call in Colorado as special sections editor. Today Kim resides in Wyoming with her husband and two children. When not writing, editing and focusing on the important work of foster parents, she’s busy chauffeuring kids to after school activities and empowering preteens as a Girl Scout leader. She appreciates a good book, time with friends and family, and beautiful days spent in the mountains. Jeremy Loudenback covers child welfare and youth justice for The Chronicle of Social Change. Based in Los Angeles, he is a graduate of Northwestern University’s Medill School of Journalism and the University of Southern California’s Sol Price School of Public Policy. Previously the child trauma editor for The Chronicle of Social Change, his work has been featured in the Los Angeles Daily News, Riverside Press-Enterprise, Atlanta Journal Constitution, the New Orleans Times-Picayune, LA School Report and other publications. Before he started at The Chronicle of Social Change, he blogged about California politics, worked with public health researchers in South Los Angeles, mentored youth experiencing homelessness on Skid Row in downtown Los Angeles and worked at a daily newspaper. He currently volunteers as an educational rights holder for foster youth in Los Angeles County. Michael Fitzgerald is the New York-based northeast editor for the Chronicle of Social Change. He oversees the Chronicle’s coverage of that city’s foster care system, one of the largest in the nation, as well as issues related to adoption, juvenile justice, health and education for youth throughout the state and the northeast. In addition to producing and assigning weekly coverage, he is a contributing editor on features and investigative projects for the Chronicle’s national staff. His reporting on law, politics, and culture for the Chronicle, Pacific Standard, the New Republic, and Outside has been cited and debated in outlets like the New York Times, Politico, Longreads, Reason, and NPR. He previously worked as a senior editor for Pacific Standard, where he wrote and edited in print and online, managed the magazine’s research department, and supported a small team that won two National Magazine Awards in three years, among other accolades. Prior to entering journalism, he completed a Coro Fellowship in Public Affairs, in Pittsburgh. Sara Tiano is a Los Angeles-based general assignment reporter for The Chronicle of Social Change covering child welfare and juvenile justice. She is passionate about nonprofit journalism and telling stories that have the potential to positively impact the systems that shape our world. Since 2015, Sara’s reporting has focused on social issues and politics and has been published in WitnessLA, Youth Today, and the Juvenile Justice Information Exchange. She has a degree in journalism from the University of Southern California’s Annenberg School, where she served as the executive editor of the school’s multimedia news operation. Her journalism has earned an award from the Los Angeles Press Club. Prior to her career as a journalist, Sara earned a degree in culinary arts from Le Cordon Bleu and spends much of her free time playing with food. She also enjoys reading, gardening, and hiking with her 10-year-old mutt, Boo Radley. Bryan Curiel is Business Development Manager for Fostering Media Connections. Bryan oversees strategic business partnerships through sponsorships and subscriptions with FMC’s publications. Bryan aims to provide these valuable resources to the many foster, kinship, and adoptive communities in all regions of the country and beyond. Bryan Curiel graduated from Occidental College, where he studied Film/Media Studies and German. Prior to joining Fostering Media Connections in 2015, he worked in Development and External relations for USC Price School of Public Policy and in business development for USC Credit Union. Bryan has combined his passions for film, languages, and music into the founding of Lavida Pictures, his nonfiction video production company. Bryan enjoys putting his creative energy into telling people’s stories and addressing important social issues. In Bryan’s free time you will see him practicing the German and Spanish languages, playing guitar for friends and family, or going on a road trip to visit your town or state.